Today, in regular Greenpeace-style, sixteen members occupied and hung banners at the Kinder Morgan oil storage and shipping facility on Vancouver's Burrard inlet. This is the same company and facility that is currently pushing Premier Christy Clark and Prime Minister Harper to approve the construction of a new pipeline to pump more tar sands oil from Alberta to our coast and off to foreign markets. 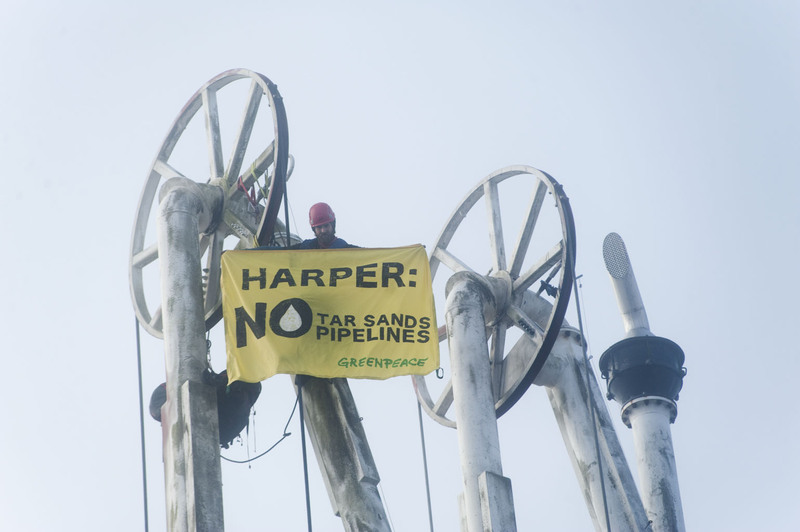 (Full disclosure: I used to work for Greenpeace USA as the Director of Online Strategy - but remain afraid of heights). Imagine the sea wall around Stanley Park lapping in oil. We would likely have to get rid of the "Beautiful BC" on our license plates. Sure there will be a short-term boost in jobs, but those jobs are typically over the day construction is complete. Long-term, there will only be around 45 permanent jobs. Less than the average McDonald's restaurant. You pay for that phone with your tax dollars might as well put it to good use!